Self-paced class with instant, lifetime access: reserve your seat now and start creating TODAY... or whenever you're ready! 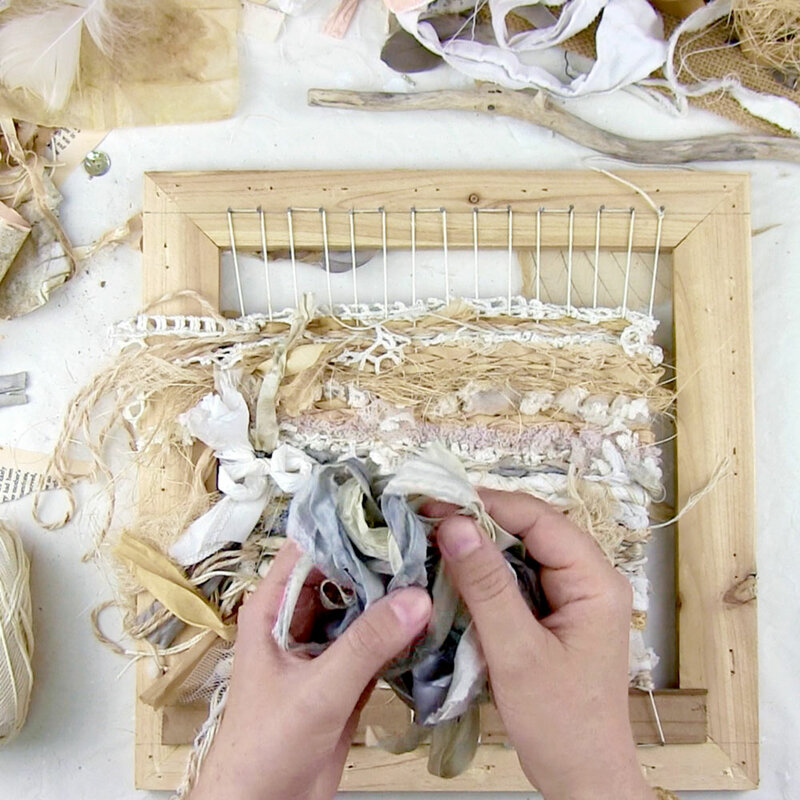 In this delightfully whimsical fiber project, we will be working with beautiful, unusual and recycled materials (yarns, ribbon, leaves, book pages, grasses and even metal!). We're going to weave exquisite mini abstract artworks that can be framed or displayed as wall-hangings, and can also be turned into the yummiest journal covers! Choose how you wish to mount your woven artworks: wall hanging? journal cover? mounted on a canvas or a plaster substrate? The sky's the limit! This online workshop has around 2 hours of highly informative videos. If you've ever taken a class with me, you know I like to explain everything in detail while keeping it clear and super inspiring! Texture is one of the most important aspects of art... and one of the most enjoyable! I love "touchable" art. 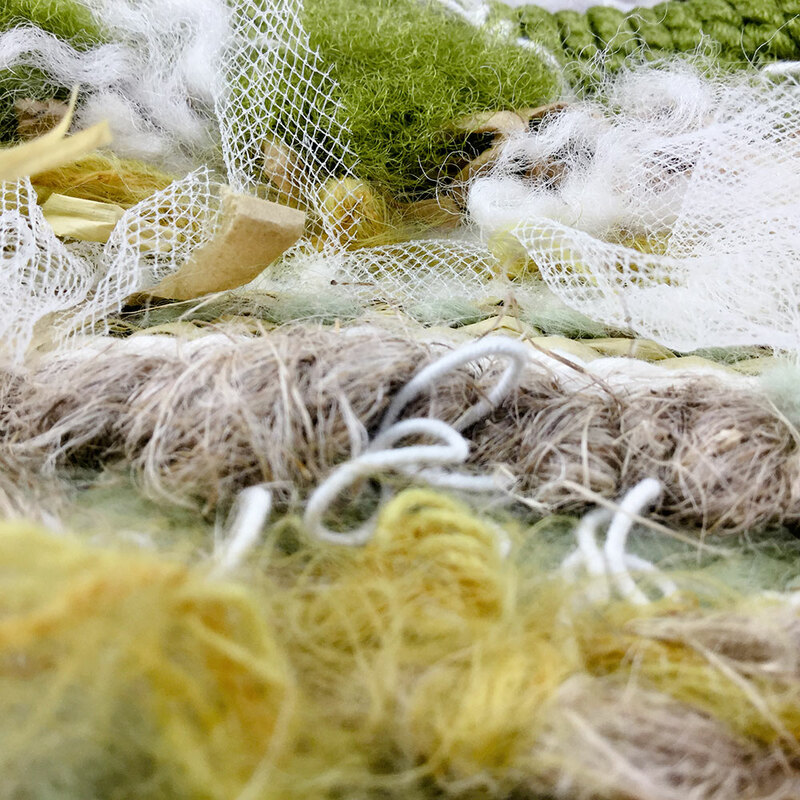 Art that involves more senses than just sight, dimensional pieces that are so intriguing and yummy you can't help but want to touch them... And fiber art takes this to a whole other level! When I look at my woven pieces, I see small abstract artworks with a tactile quality that I couldn't create any other way. Knitting left-overs: You wouldn't believe how many balls of wool await in dusty cupboards around the world, especially the tangled ones that no one will ever bother sorting out... If you don't have any yourself, ask around to friends and family for left-overs from their knitting and crochet projects, to a nursing home or your local community center. You could even gift them one of your creations! Nature: get outside and open your eyes to the beauties of nature as you collect twigs, leaves, flowers, seeds, feathers and grasses to incorporate into your weaving. Paper: book pages, tissue paper, tea bags, wrapping paper, natural fiber paper such as mulberry... any kind of paper that's not too stiff will work great, and you can even decorate them before incorporating them into your art!